FrenchFlicks.com is the first website to list all French movies released and shown in the US. Don't miss the latest Jean Dujardin movie, the film series about Juliette Binoche, or the special screening of Amélie in a theater near you ! For each French movie, you will be able to know in which cities it is playing and its showtime. FrenchFlicks.com will also keep you updated about every French film festival in the US. And don't miss our weekly review of a French movie available on Netflix. Each month, FrenchFlicks selects the best French films available on Canal+ International and Studiocanal through DIRECTV. In April, we experience everything from movie musicals, to thrillers to one of the most popular comedies of the year 2000, Podium. As a cherry on top, La cuisine au beurre, a special post war 60's classic featuring Bourvil and Fernandel, is served up on the menu. 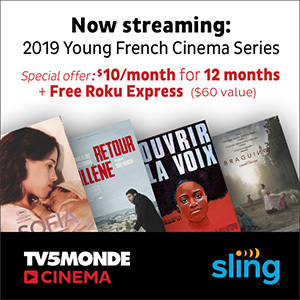 This month, TV5MONDE Cinema On Demand is teaming up with Young French Cinema, a Unifrance program showcasing some of the best talent of this generation's French filmmakers. Young directors have a strong message to share with today's viewers, and themes tend to revolve around the increasing clash between social and political class and cultural systems. What's more, this lineup can't be found in theaters, so best to tune in! For diehard Spanish Apartment fans, Amazon has decided to resurrect the worldwide favorite, picking up a sequel as an 8 part series to premiere in 2020. The Criterion Channel will be launching on April 8th in the U.S. and Canada. It will be available on desktop, Roku, Amazon Fire, Apple TV, iOS, and Android devices. Many French and francophone films will be part of the line-up. You can thank him - and Julia Child - for all the cooking shows that invaded your TV in the past 15 years. He will be honored in Los Angeles this May 3rd.